German Economics Minister Brigitte Zypries says new US sanctions law violates international law. The German government has again weighed in with strong criticism of the latest US sanctions bill. We consider this as being against international law, plain and simple. Of course we don’t want a trade war. But it is important the European Commission now looks into countermeasures. These are exceptionally strong words coming from the Economics Minister of the country which is the US’s most important ally. They also underscore the folly of the latest sanctions bill. In saying that the proposed sanctions go against international law Germany is now publicly contesting the US doctrine of the universal worldwide applicability of US law. To be clear this doctrine has never had any legal basis and is in fact contrary to international law exactly as Brigitte Zypries says. However the US is passionately committed to it, and its allies have up to now passively cooperated with it. However by going against the fundamental economic interests of its own allies the US has now provoked the most powerful of them – Germany – to contest it publicly. I would add that a suggestion from the German Economics Minister to the European Commission to look at countermeasures against the US sanctions is all but an order from Germany to the European Commission that it do just that. There is a political dimension to this strong German position. Germany has parliamentary elections later this year, and with German public opinion strongly opposing the latest US sanctions neither of the two parties that make up the ruling coalition – the SPD or the CDU – will want to look like they are backing down before the US on this issue. 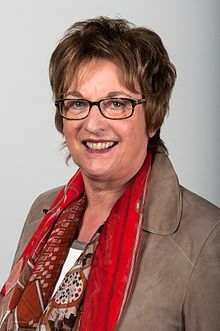 Brigitte Zypries is from the SPD, which appears to be positioning itself as the champion of German national interests against the US sanctions bill. Merkel and the CDU will not want to be put in a position where they appear to be conceding this role to the SPD. Though President Trump has indicated that he will sign the new sanctions law, there is actually still scope for negotiation between the US and Germany. President Trump would have to make an Executive Order before German or European companies which participate in Russian pipeline projects or in Nord Stream 2 could be fined under this new sanctions law. He may have no wish to do so or he could – following negotiations with Germany and the EU – sign an Executive Order that safeguards the positions of German and European companies which participate in such projects. My guess is that this is what will eventually happen. However the US should never have put itself into this position in the first place. A thoughtless law overwhelmingly carried by the US Congress because of a domestic quarrel will have no significant impact on Russia’s economy but has already provoked a Russian response which threatens to tear the heart out of the US diplomatic and intelligence presence in Russia whilst setting the US against Germany and its other key European allies. It would be difficult to think of anything more counterproductive but that is the route legislators in the US Congress have overwhelmingly chosen to take. Alexander Mercouris is Editor-in-Chief at The Duran.